A friendly, professional service with NO hard sell - guaranteed! Cleaning, repair and moth-proofing facilities. 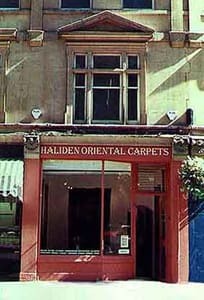 Haliden Oriental Carpets shop in Bath. Trading in Bath since 1988, Craig Bale and Andy Lloyd of Haliden have earned an international reputation for offering rare and exciting antique oriental rugs and old tribal weavings. They are veterans of many of the worlds textile-art based shows including ACOR, ICOC, The San Francisco and L.A Tribal art shows and the prestigious Hali fair in London. They now offer a large range of modern rugs with an eye towards the unusual and emphasis on quality at all prices. 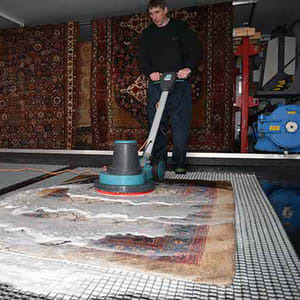 They have a fresh approach to the business and can offer a range of floor coverings from early antique Persian carpets and rare collectable Turkmen and tribal rugs to super - contemporary, modern and traditional products. Haliden.com was the UK's first web site specializing in traditional and antique carpets, old tribal carpets and Persian rugs and is today one of THE most active sites of its kind. Many of the world's most distinguished dealers and collectors are regular visitors to this site. This site showcases our online inventory of antique, collectable and old decorative oriental rugs in addition to contemporary, modern or traditional hand knotted area rugs. Haliden offer a full cleaning and restoration service in our own purpose built workshop. 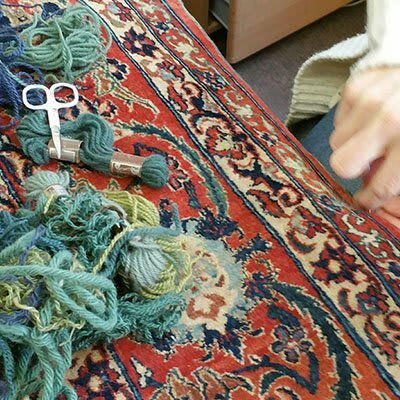 Over 30 years experience in cleaning and repairing all types of hand woven carpet. Top quality work guaranteed at competitive rates, no job too big or too small. Quotations for most work can be given from images. Our online inventory is updated several times a year and we operate an alert service for the convenience of our clients. If you wish to be advised of inventory updates, please subscribe below. Your email address will be used ONLY for Haliden update alerts and will NOT be divulged to any third party. If you no longer wish to recieve update alerts, please unsubscribe and we will delete your email address from our mailing list. Business hours are: Monday,Thursday, Friday and Saturday, 10:00am - 17:00pm or by appointment. All prices are quoted in Pounds Sterling and do not include shipping or insurance. These prices may be subject to change from time to time. Payment may be made by Cash, MasterCard, Visa, PayPal, bank transfer or cheque made payable to Bale Antique Rugs in Pounds Sterling. Credit cards may attract a 2% surcharge. Goods are dispatched using FedEx or Interlink Express and can normally be received anywhere in the world within a week of receipt of payment or next day in the UK. An example cost is £70 for a 10 kilo box to California (subject to change). In some circumstances it may be possible to receive goods on an approval (sale or return) basis. This service is available at my discretion and will be considered on a case-by-case basis and may be subject to certain conditions and criteria. Sizes are approximate. Descriptions and condition reports are prepared to the best of our knowledge but they are for guidance only, without legal obligation or prejudice to our standard conditions of sale. Users contacting this website and/or its owners do so at their own discretion and provide any such personal details requested at their own risk. Your personal information is kept private and stored securely until a time it is no longer required or has no use, as detailed in the Data Protection Act 1998. Every effort has been made to ensure a safe and secure form to submit emails but advise users using such form that they do so at their own risk. This website operates an email stock inventory update alert service. Users can subscribe through an online automated process should they wish to do so but do so at their own discretion. Subscriptions are taken in compliance with UK Spam Laws detailed in the Privacy and Electronic Communications Regulations 2003. All personal details relating to subscriptions are held securely and in accordance with the Data Protection Act 1998. No personal details are passed on to third parties nor shared with companies/people outside of the company that operates this website. In compliance with UK Spam Laws and the Privacy and Electronic Communications Regulations 2003 subscribers are given the opportunity to un-subscribe at any time through an automated system. This process is detailed at the footer of each email alert. If an automated un-subscription system is unavailable clear instructions on how to un-subscribe will be detailed instead. Although this website only looks to include quality, safe and relevant external links, users are advised adopt a policy of caution before clicking any external web links displayed within this website. The owners of this website cannot guarantee or verify the contents of any externally linked website despite their best efforts. Users should therefore note they click on external links at their own risk and this website and its owners cannot be held liable for any damages or implications caused by visiting any external links mentioned.